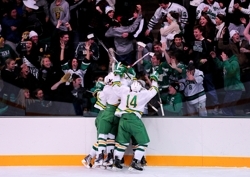 Edina players surround Jon Cote to celebrate the game-winning goal with 0:03 left in the game. Photo by Adam Crane. 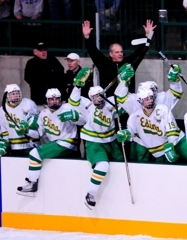 When Edina's Jon Cote looked up at the scoreboard he saw three seconds left on the clock. 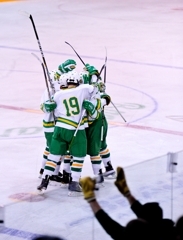 Just enough time to light the lamp for the Hornets, as Cote scored the game-winning goal in Edina's 5-4 victory over Burnsville on Thursday, Dec. 2. 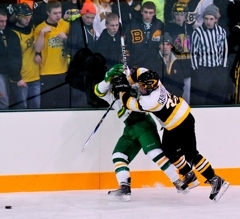 Cote's game-winning goal came after a barrage of shots were fired at Burnsville's Bodhi Engum. A loose puck came to Cote's stick, and he nudged it past the Blaze goaltender with three seconds left. 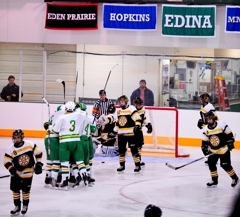 As the puck slowly slid across the goal line, the Edina fans erupted and the Hornets swarmed Cote as they started the celebration in their first home game at the newly remodeled, historic Braemar Arena in Edina. "That second goal, I was just trying to get anything on net in those last few seconds," Cote said. "Got it to go in. "I didn't even see it go in. I was so surprised. I had no idea. I don't even know what happened. I looked up at the clock and saw that there were like two seconds left and I just threw it right in front. "I don't know, it just went in." Cote also provided the game-tying goal in the third period. With the Hornets down 4-3, teammate Michael Sit carried the puck toward Engum with speed but fanned on the shot. Sit quickly recovered to center the puck to Cote, who made no mistake and buried the puck past a sprawling Engum. "Michael Sit gave me a great pass from the corner," Cote said. "He's a great hockey player." 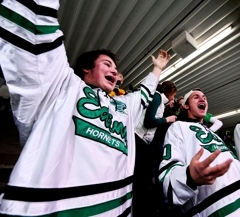 The game-tying goal by Cote sparked some momentum for the Hornets and ignited the Edina home crowd. Cote would, of course, provide more theatrics just more than three minutes later. "After Jon (Cote) scored both those goals I was just pumped," Sit said. "On both of them I just threw that puck to the net and saw both Bennie (Walker) and Jon (Cote) crashing the net hard and they just slammed them in." Burnsville dominated the early going. The Hornets found the penalty box more than the back of the net in the first period, a trend that had plagued the Hornets early this season. 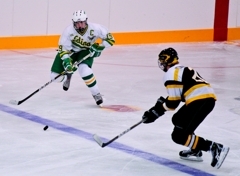 Edina took four penalties in the opening period, while Burnsville had three. 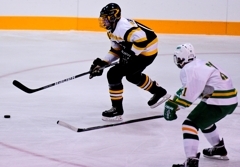 Two of Burnsville's three first-period goals came on power plays. "That's definitely something that we have to work on," Cote said. "I have to work on it just like every other player has to work on it. That's something we're going to work on a lot over the next few weeks. We got a lot of time to improve on that though." Cote received a slashing penalty early in the first period when the Hornets were on a power play. 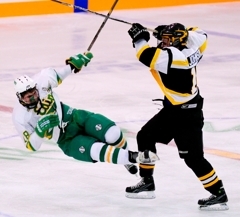 Cote also received a charging penalty - a penalty that was offset by a charging penalty on Burnsville's Hunter Anderson - during a small scrap in front of the Burnsville net that also sent Sit to the box for roughing Engum. Successful results on the power play gave the Blaze the early momentum. "(Burnsville) just came out quick and we knew they were going to," Sit said. "We just tried to turn it around late in the second and started putting pucks on net and tried to pop a couple home quickly." 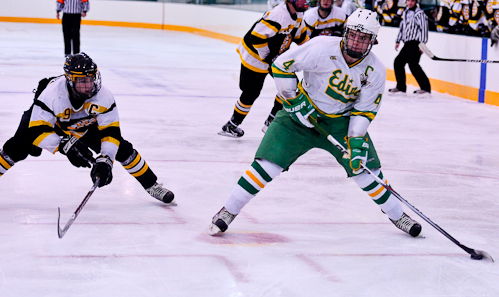 After Burnsville scored on the power play in the second period to put the Blaze ahead 4-2, Edina flipped a switch and looked like a different team. "(Head Coach Curt Giles) told us it was a section game and it was really important for seedings," Sit said. "We knew we had to come out and go hard to the net and just come out flying so we could give them a run for their money at the end of the game." 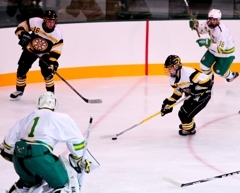 The Hornets showed they listened to their coach as they scored three unanswered goals and took control in the third period outshooting Burnsville 12-3. Cote's heroics were obviously the highlight of the third period as he made up for his early penalties. "I'm just really excited," Cote said. "This is a lot of fun." 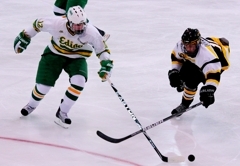 Edina will try to continue the fun on Saturday, Dec. 9, against Eagan when the Hornets take on the Wildcats at Braemar Arena at 7 p.m.
Edina' Michael Sit carries the puck in on Burnsville's Bodhi Engum (in goal). Photo by Adam Crane. Michael Sit leads the Hornets with six points (1 G, 5 A) in three games. 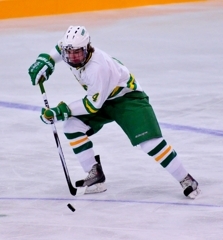 Sit played for Team Southwest in the Upper Midwest High School Elite Hockey League this fall and registered 10 points (3 G, 7A) in sixteen games. "(The Elite League) definitely helped me a lot for this season because the pace is so much higher and it gives you games before the season to prepare so you're ready for game play and you're not just doing clinics," Sit said. "You're ready when it's time to play a (varsity) game. 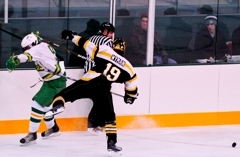 The senior forward picked a great time to light the lamp as he was able to beat Bodhi Engum twice in the third period. 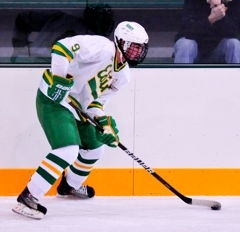 With his team down by one, Cote received a great centering pass from teammate Michael Sit and popped the puck into the back of the net which tied the score at 4 and ignited the Edina home crowd. Cote then became the hero as his shot slowly trickled past the goal line with 2.7 seconds remaining. Those goals ended up being the game-tying and game-winning goals. 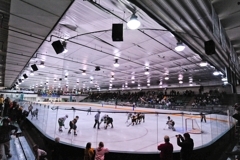 Sit's power-play goal and two assists propelled the Hornets against the Blaze. The senior co-captain scored five seconds into a power play at the end of the second period and assisted on teammate Max Everson's first-period power-play goal and Jon Cote's game-tying goal. 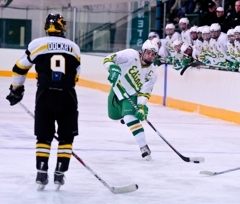 The Blaze senior forward scored two power-play goals against the Hornets. Childs (pictured below) scored twice for the second straight game, stayed out of the penalty box and played great at both ends of the ice. 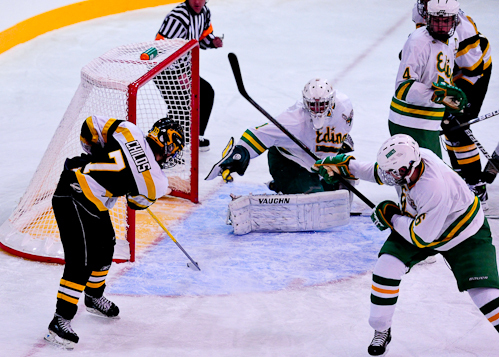 Burnsville's Jace Childs taps in his second power play goal as Edina's Connor Girard, Max Everson and Matt Nelson can only watch. Photo by Adam Crane. 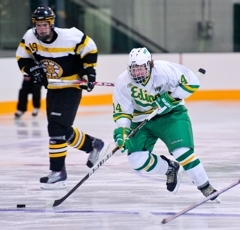 Jon Cote scored twice, including the winner with less than 3 seconds left, during Edina's 5-4 victory over Burnsville on Thursday, Dec. 2, at the newly remodeled Braemar Arena in Edina. 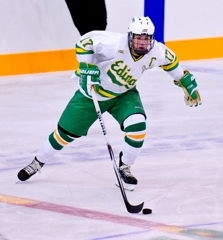 Edina senior co-captains Michael Sit and Max Everson each finished with one goal and two assists, and junior forward Ben Walker contributed three assists in the winning effort for the Hornets. Everson's goal came on the power play and was a powerful slap shot from the point that found the top shelf. Two of Walker's three assists were on the power play, and he tallied his final assist on Cote's game-winning goal with 2.7 seconds remaining. 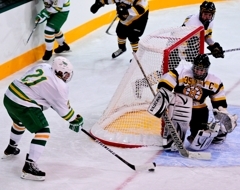 Edina goaltender Connor Girard finished with 14 saves. 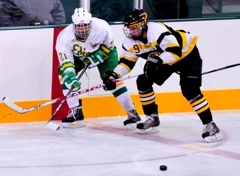 Burnsville took advantage of Edina's penalties as three of its four goals came on the power play. The Blaze's top line and top power-play unit provided a majority of the scoring punch. Jace Childs scored two power-play goals. 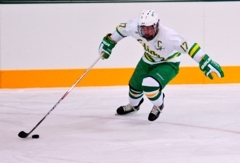 Mike Dockry also scored a power-play goal and added an assist on one of Childs' goals. Defenseman Eddie Wittchow registered two assists, with both coming on the power play. Burnsville's Bodhi Engum made 27 saves. Ironically, both teams will face Eagan in their next scheduled game. 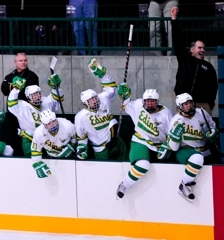 The Wildcats travel to Edina on Saturday, Dec. 4, and then travel to Burnsville on Thursday, Dec. 9. Both games will be a 7 p.m.